I recently saw two ultra-violent historical fantasies in close succession. One was The Eagle (2011) based on Rosemary Sutcliff’s novel The Eagle of the Ninth. It’s generally considered a bookend to the vastly superior Centurion (2010) but the pairing is inaccurate – their sole similarity is their focus on the “vanished” Legio IX Hispana. The other was Rustam Mosafir’s Scyth (2018 – the English title is The Last Warrior), which at first glance could be thought as the mirror twin of The Eagle. But whereas The Eagle is a self-satisfied by-the-numbers bromance, Scyth hums a whisper that becomes a scream by the film’s end. To those who haven’t seen these films, keep in mind that the discussion which follows contains terminal spoilers. Are awash in graphic gore and kyriarchal machismo – honor and revenge, blood oaths and ritual scarrings, alpha circling and measuring of belt lengths; there are no women characters (the protagonist’s wife in Scyth is essentially a plot lever, though he’s shown to truly love her; Eagle has thankfully decided to omit women altogether, in contrast to Centurion that showcases powerful women even as it hews to traditional good/evil dichotomies). Boast stunning scenery (the Scottish Highlands for Eagle, the Crimea for Scyth) and haunting incidental music: celebrated Allan McDonald chants canntaireachd (the verbal notation for bagpipe tunes) in The Eagle, while Scyth contains a synthed-up version of “Dle Yaman” (“Plaint”), a traditional Armenian lament played on the duduk. Unapologetically use multiple languages that require (horrors!) subtitles – something also utilized to tremendous effect in Brendan Muldowney’s ferocious Pilgrimage. Depict liminal places and eras, though they barely feint towards historical accuracy: northern Britain just before the Roman withdrawal (a nexus that gave rise to the Arthurian mythos); the Black Sea area when the barely-christianized Varangian warrior elites were fighting the pagan Kipchaks and Cumans (aka Polovtsians) to establish the Kievan Rus’ Federation. Have chosen to depict the native adversaries of the expansionist powers as mélanges of American Great Plains peoples with soupçons of classical Sparta – though there’s a fascinating wrinkle in Scyth that we’ll explore later. Show loyal retainers used as pawns and scapegoats by ruthless, power-hungry liege lords (not surprisingly, the Rus’ strongman in Scyth exhibits attributes of Ivan Grozny and Stalin – and of his likely inspiration and namesake, Oleg of Novgorod). Adhere to the well-worn Thor/Loki trope of the sturdy, rule-abiding mesomorph and the wily, mercurial endomorph bonding reluctantly to achieve overlapping goals despite fundamental differences and inherited enmities. So far, so standard. But Scyth, unusually for a film of its type, actually has a quasi-coherent plot – plus a few crinkles that make you wonder what a remarkable film it could have been if Mosafir had dialed back the gore and made the unique echoes more central to the tale. 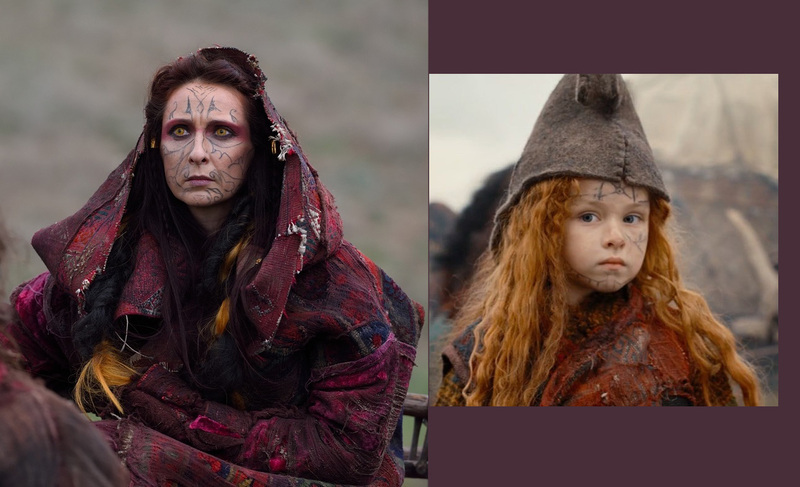 A telling early sign is how the two films portray the local cultures. The Eagle is beyond perfunctory in its depiction of the Caledonian groups that Marcus and Esca encounter. The most prolonged interaction presents a Highlands society as a homogenized goo of the Clay People in Quest for Fire, the Spartans in 300 and the Iroquois in Black Robe – and totally wastes Tahar Rahim, who was a magnetic presence in Un Prophète. In contrast, Scyth shows several distinct cultures just sufficiently to evoke a sense of the complexity of that region and era. It’s true that a pivotal scene is straight out of Mad Max Beyond Thunderdome, and Mosafir mostly opts for the smorgasbord shorthand that denotes “barbarism” in such films. Yet the artifacts and rituals do have a semblance of specificity: sinuously-shaped gold was an integral feature of Scythian metalsmithing; equally sinuous tattoos were common in many Eurasian steppe cultures (of which more anon); shamanism is shown as a matter-of-fact backdrop; and there’s a throwaway scene – you’ll miss it if you blink – in which you hear what apparently was a major dilemma for the Rus’ and Khazars when they were debating which monotheistic religion to adopt. So we come to the scream that sets Scyth apart. Lyutabor eventually meets the “Scythians” who are shown as the deracinated, beleaguered remnant of a once-proud if harsh culture, its warriors (the Wolves) reduced to banditry and ransom kidnappings for survival. 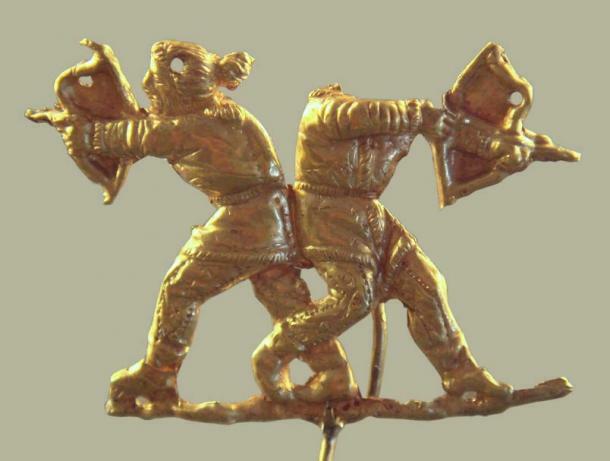 The real Scythians were fearsome masters of mounted warfare who established (and for a while controlled) the Silk Road and left behind kurgan burials with magnificent – as well as gruesome – offerings. Mosafir once again resorts to shorthand by using “Scythian” to denote a group that inhabits land coveted by empire-building newcomers – a story as familiar to Russia (in both its tsarist and Soviet incarnations) as to the US and the Roman, Ottoman and Inca empires. But though the band are called Scythians, the visuals tell a different story: the Wolves’ attires borrow elements from the Byzantine Akrítai and the Scythian/Sarmatian cataphracts, but the band members’ hair colors, tattoos and accoutrements identify them as Tocharians. They, too, were a power along the Silk Road, Celts who left a fascinating record of cultural dispersal in the mummies of Ürümchi and on the cave frescoes and scrolls of the Tarim Basin. 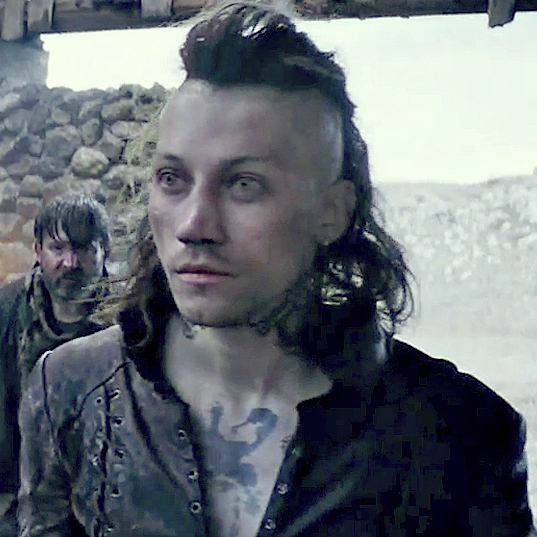 After Marten gets killed in his attempt to become the Wolves’ leader (deflating the film considerably by his departure), Lyutabor gains the position and convinces the band’s formidable Elder that they’ll be safe under his liege-lord’s protection. When he leads them to Prince Oleg in naïve good faith, the latter calmly orders them all massacred – a reenactment of Wounded Knee with hails of arrows instead of Hotchkiss machine guns. This lengthy coda is where Scyth for the first and only time shows everyday familial love (beyond Lyutabor momentarily dandling his firstborn), crowned by a felled young husband reaching for his dying wife’s hand. One could argue that this betrayal, the final of many, is required to propel Lyutabor into the defiant act of honor that will almost certainly result in his meeting Marten soon thereafter (the Russians are as sentimental as the Americans, but prefer downbeat endings to their epics except when Teuton knights of any era are involved). Nevertheless, the Scyth coda leaves a radically different aftertaste than The Eagle, where the two buddies saunter off bantering after they’ve cleared Marcus’ family name by delivering the legion’s recovered eagle standard to his superiors. The DVD contains a less-annoying alternative ending, in which Marcus leaves the standard on the pyre of the legion deserters who had made a life among the Celts and died protecting him. Lyutabor’s berserker rage and Marten’s balletic fighting are customary action fare, if a notch better than the usual; their reluctant alliance, though unusually nuanced, is still standard-issue male bonding. However, in that final coda Scyth departs from sword-and-sandal territory and veers into (granted, brief) social critique. With little ado, it weighs the scales against high-flown notions of honor (and certainly against empire-building, which routinely co-opts honor to serve its ends) in favor of human-scale interactions. This goes against the grain of a genre that always glorifies individual heroism, never the ceaseless weaving that creates a society’s tapestry. And that makes Scyth subversive despite itself.